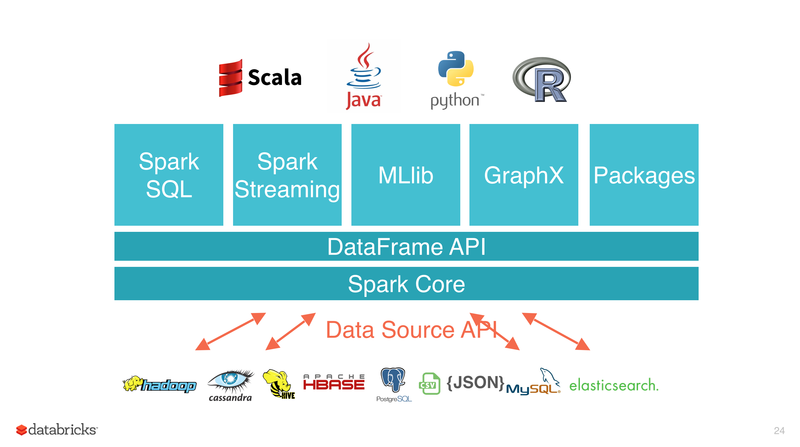 With the Apache Spark 1.3 release the Dataframe API for Spark SQL got introduced, for those of you who missed the big announcements, I’d recommend to read the article : Introducing Dataframes in Spark for Large Scale Data Science from the Databricks blog. Dataframes are very popular among data scientists, personally I’ve mainly been using them with the great Python library Pandas but there are many examples in R (originally) and Julia. Of course if you’re using only Spark’s core features, nothing seems to have changed with Spark 1.3 : Spark’s main abstraction remains the RDD (Resilient Distributed Dataset), its API is very stable now and everyone used it to handle any kind of data since now. But the introduction of Dataframe is actually a big deal, because when RDDs were the only option to load data, it was obvious that you needed to parse your « maybe » un-structured data using RDDs, transform them using case-classes or tuples and then do the special work that you actually needed. Spark SQL is not a new project and you were, of course, able to load your structured-data (like Parquet files) directly from a SQLContext before 1.3 – but the advantages were not that clear at the time – except if you wanted to run SQL queries or expose a JDBC-compatible server for other BI tools. Of course the second way of writing it is obviously more concise and more understandable, but I’d like to add something else, the tried-and-tested Spark programmers have surely noticed the reduceByKey transformation used here. It is a very common mistake in Spark for common aggregation tasks to use the groupBy then mapValues or map transformation which can be dangerous in a production environment and produce OutOfMemory errors on workers. .reduceByKey((x, y) => (x._1 + y._1, x._2 + y._2)) // simple right ? Without even trying to consider the complexity of all I had to write to get all my answers – answers that I would need to join back if I want a consistent RDD with all the informations I need – the most painful point is that I had to duplicate all these aggregations and therefore cache my dataset to mitigate the damages. This is a higher level of programming than RDDs, so some things might be more difficult to express with Dataframe than they were using RDDs when you could groupBy(…) anything and get the List[…] of result as values… But this was a bad practice anyway :). 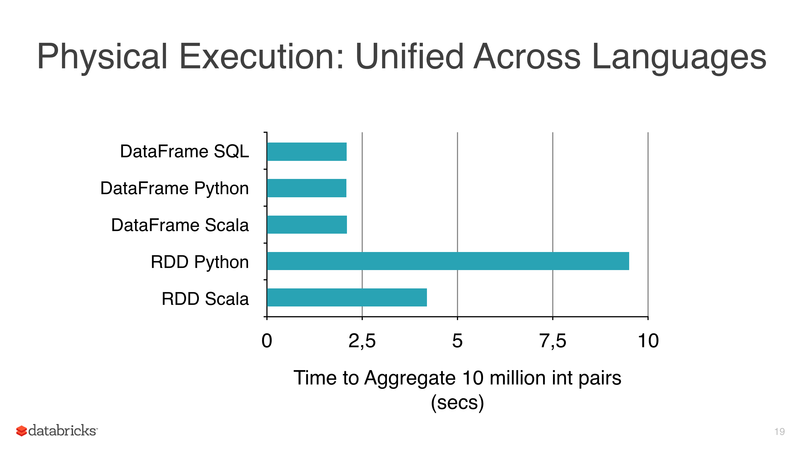 I won’t get into the depth of this here, because that would even need more than one full article about it, but if you want to understand more this article Deep dive into Spark SQL’s Catalyst optimizer from the Databricks blog (once again) will give you insights into how this works. A simple rule if thumb to get is that a lot of « pretty logical » generic tree-based rules will be used to check and simplify your parsed-Logical Plan and then a few Physical Plans representing different executions strategies will be computed and one will be selected according to their « computation cost ». The funny thing is that in the end – nothing changes – after all these transformations your Dataframe will get *compiled* down to RDDs and executed on your Spark Cluster. This is still true if you want to use Dataframe’s User Defined Functions, you can write them in Java/Scala or Python and this will impact your computation performance – but if you manage to stay in a pure Dataframe computation – then nothing will get between you and the best computation performance you can possibly get. You’re partially right because if you don’t already know Pandas or R API, Dataframes are a new thing and you’ll need some work to harness it – but remember that in the end, everything comes down as RDDs – so all that you learned before is still relevant, this is just another skill to add to your resume. 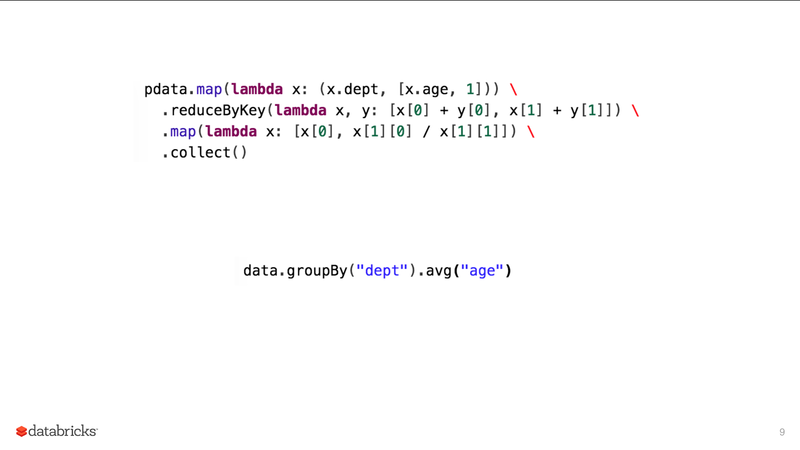 You mention using `.agg` on the result of a groupby via the DataFrame API but I can’t seem to find support for that capability. Do you know anything about it? I should be more specific: it seems that you can only use built-in aggregation functions right now. Is that the case?